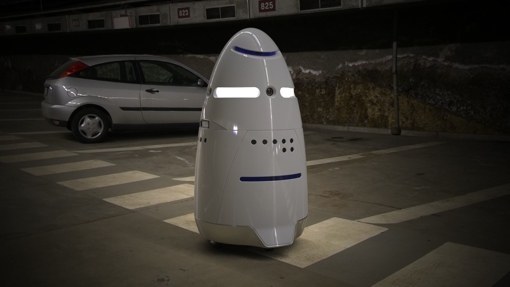 Robotic Security Guards: Coming Soon to a Mall Near You? service at a Silicon Valley tech company by the end of the year. All hail our new robot overlords! The MIT Technology Review recently reported that Knightscope, a new startup based out of California, has created a new line of robotic security guards. The company’s 5-foot tall K5 robots, as they're named, are designed to patrol schools, shopping malls, warehouses and other domains where human guards are currently in use. The bullet-shaped robocops use a range of sensors and cameras to understand their surroundings and detect potential intruders. Each robot is equipped with four high-definition cameras for 360-degree views, a fifth camera for license plate recognition, four microphones, navigation equipment and weather sensors that can detect changes in pressure and temperature. Anything suspicious is reported wirelessly to a human in a nearby command center. The robots are unarmed, though they can emit a loud, ear-piercing alarm. “This takes away the monotonous and sometimes dangerous work, and leaves the strategic work to law enforcement or private security, depending on the application,” explained Knightscope cofounder Stacy Stephens to the Review. Knightscope is billing the new bots as a cost-effective alternative to human security guards. The average security guard in the U.S. makes $13.24 per hour. A K5 robot, meanwhile, can be deployed for less than half the cost. The cost savings may be appealing, but there are a number of hurdles the technology needs to overcome before robots start patrolling a shopping mall near you. Many people feel threatened by robots, especially human-sized, 300-pound behemoths like the K5. The bots are also prone to tipping over should they wander off a walkway or edge – again, no small problem considering their weight. well who out there thinks this will end well? lets see a show of hands?